Page last edited 2013-01-06 11:44:02 (version 24). 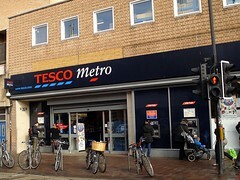 A small Tesco shop on Cowley Road (but relatively large for their Metro brand). Often very busy with long queues at peak periods, you can expect to be around 10 mins waiting. Opinions differ on the quality of produce and service available at this shop. Reviewers have warned of inflated prices and stale produce, but compare it favourably to other city centre supermarkets, and generally seem to think it has a decent range. Last edited 2013-01-06 11:44:02 (version 24; diff). List all versions.